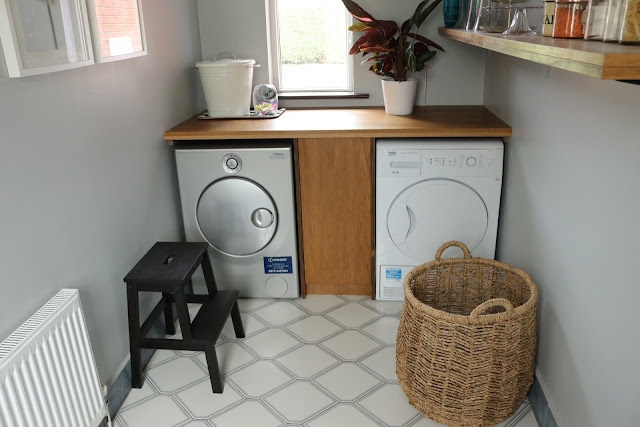 The story of our laundry room makeover is one of luck and a very tight budget. When we moved into our home, there was no tumble dryer and no allocated space for one either in the laundry room. 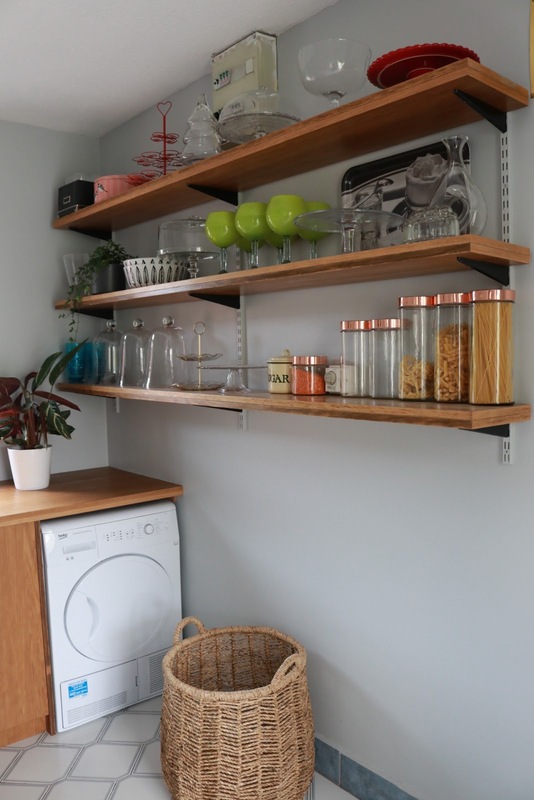 It was a very dated space and the cupboards and shelving were showing a lot of wear and tear. As we rent our home, we didn't have a big budget to redo it (even though our landlord was okay with us fitting a dryer in at some point) so when we bought one in the January sales last year, we lived with having it plonked in the middle of the room, which blocked access to the cupboards behind and was basically a pain to work around. 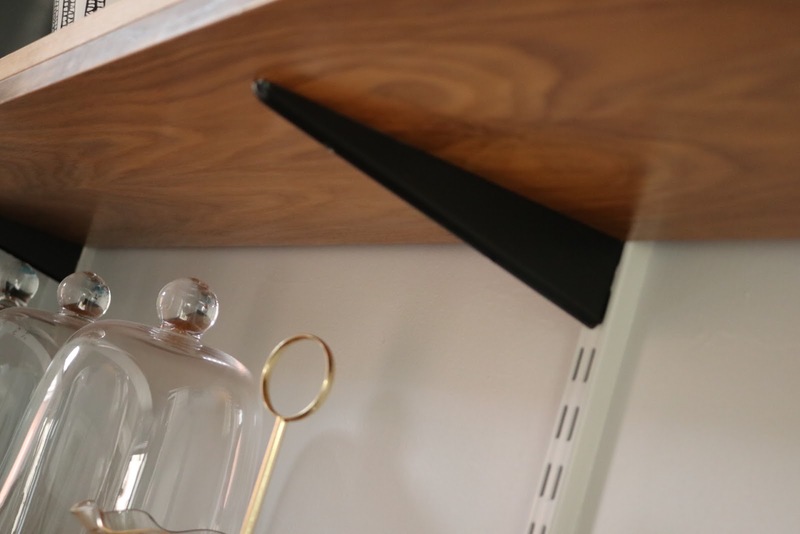 The existing shelves were wobbly and were bowed in places so I was loathe to put much on them. The only redeeming feature in the room was the lovely floor tiles. It was a very unloved space for a very long time. Then as luck would have it, David came across some wood that had been removed as part of an office refit and the guy said he could take it if he liked. It was lovely wood with a nice patina so he gladly accepted it and we set about our plan to reinvent this space. Firstly, we had to rip out the old unit and what lay behind it was the stuff of home makeover horrors. 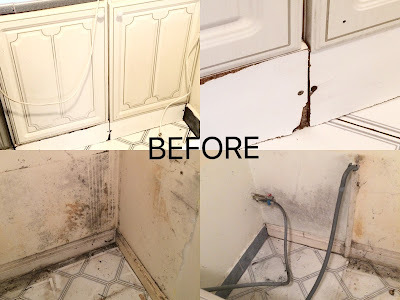 Mould and mildew were on the walls, and the tiles were very grubby so I took to cleaning it all down with Cillit Bang Mould Remover (mask and gloves in tow of course) which did a brilliant job before I prepped it for painting. 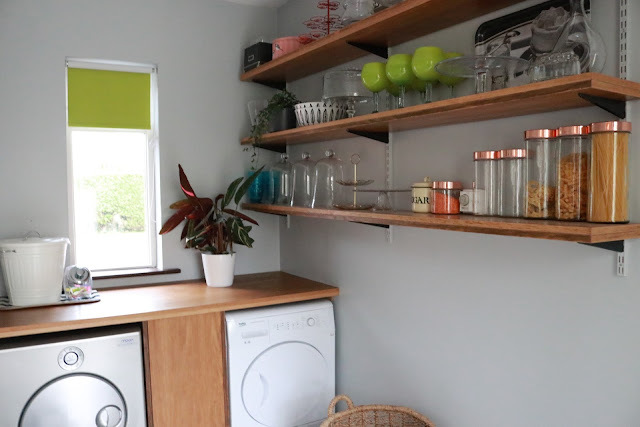 I repainted the walls with B&Q Colours paint in 'Soft Rain', which at the time was on special offer for two 2.5L tubs for just €25. 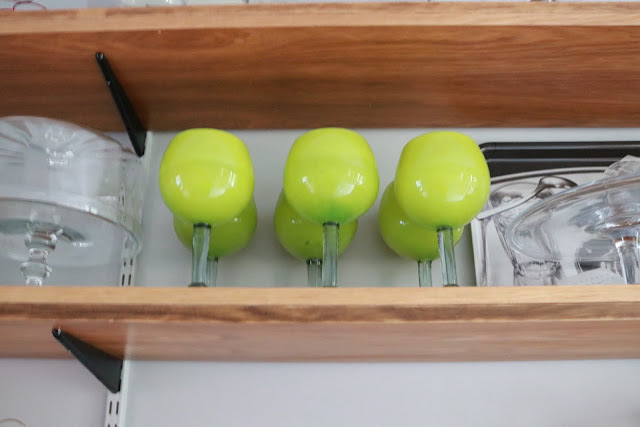 For a budget paint, I found it good to work with and the price point was just perfect. It gives a nice coverage and the colour is a lovely shade of grey with blueish undertones and complements the floor tiles beautifully. Next, it was time to tackle the shelves. 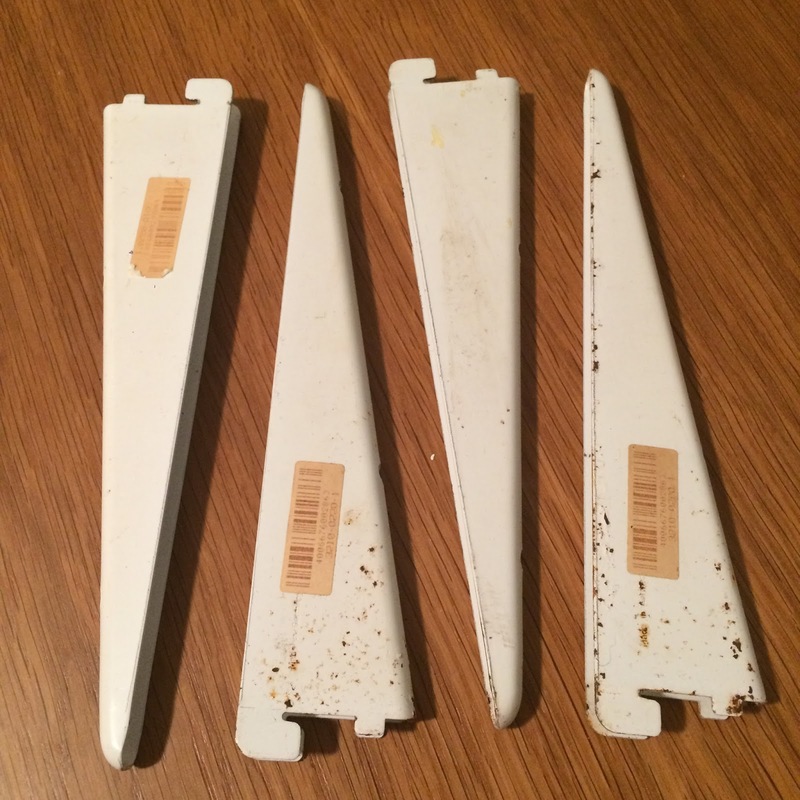 The brackets were perfectly sturdy, but had a little surface rusting and still had their original barcode stickers on them. 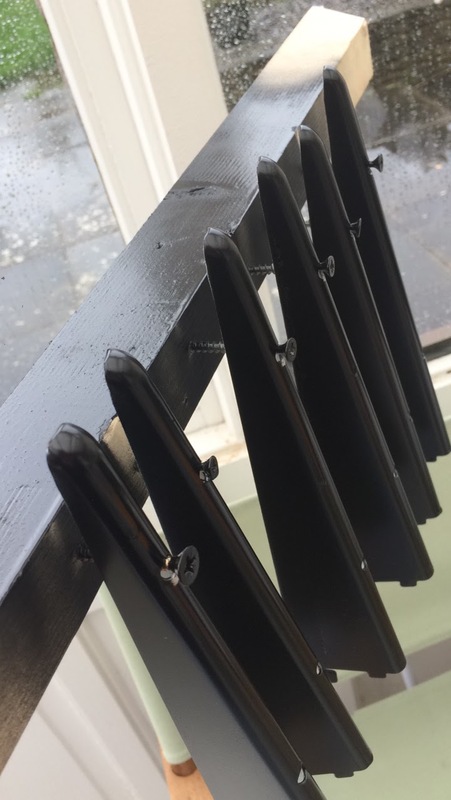 So, after a good clean down, we bought a can of Rustoleum in black for €9.95 at our local paint shop and resprayed them. 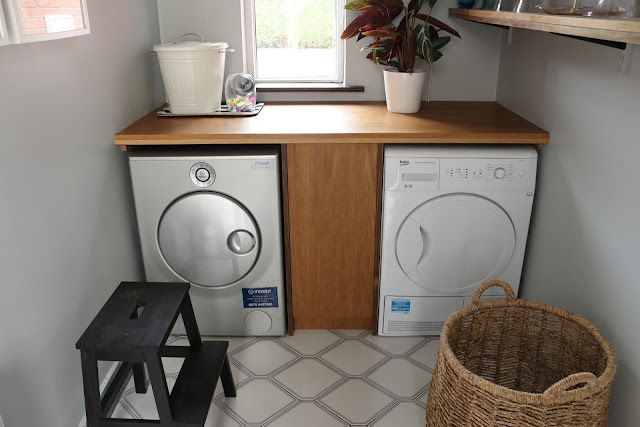 David doubled the wood width to make nice thick shelves and set about making cabinetry to house both the washing machine and the dryer with a central cupboard for detergents etc. 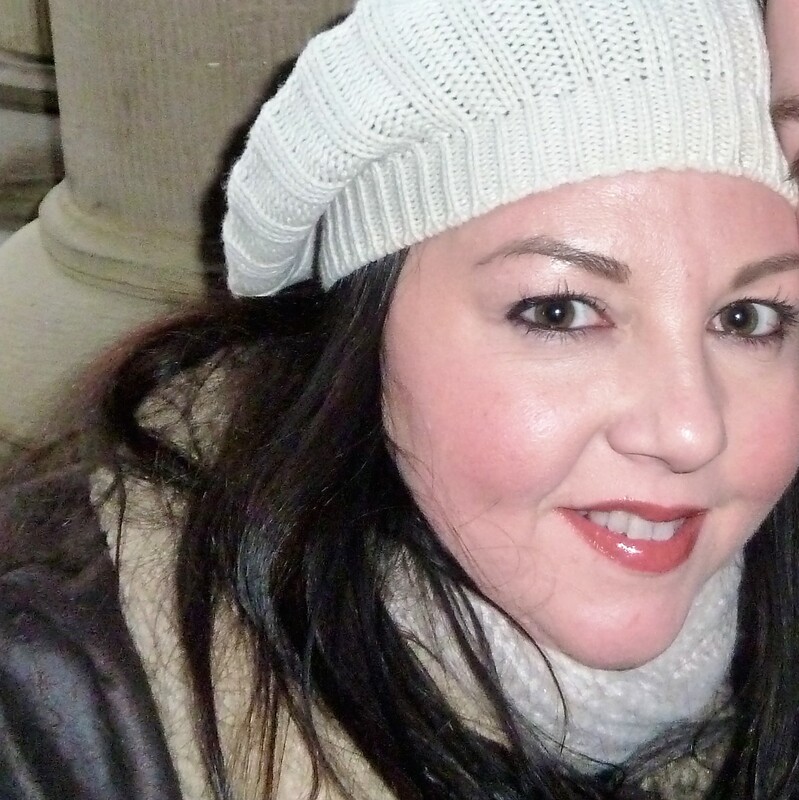 with a soft touch closer. Luckily, David already had the various hardware required to fit everything, and there was no labour cost involved as he fitted it all. 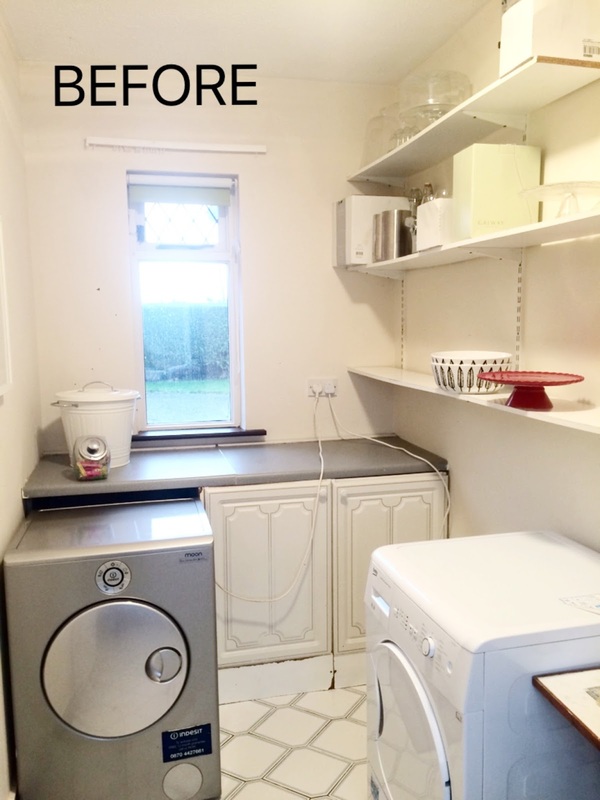 New fitted cabinetry to house the dryer and washing machine with central cupboard. 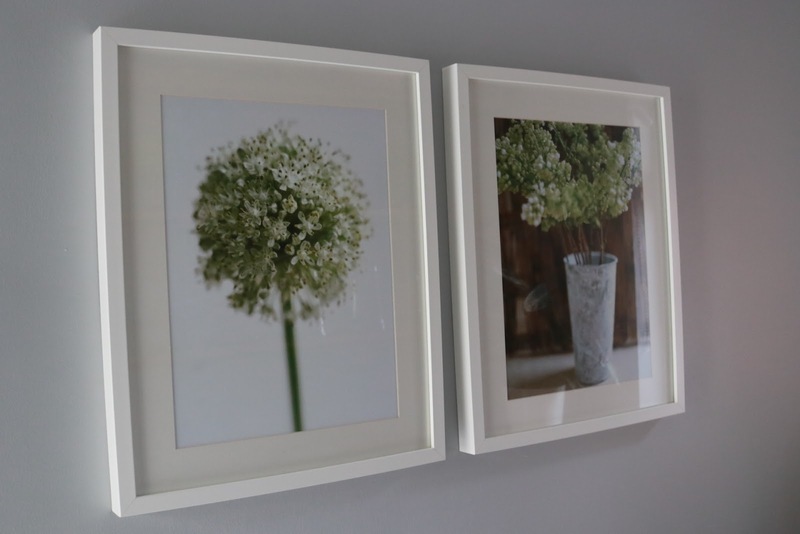 Once all the cabinetry and and shelving was in place, I set about dressing the room. 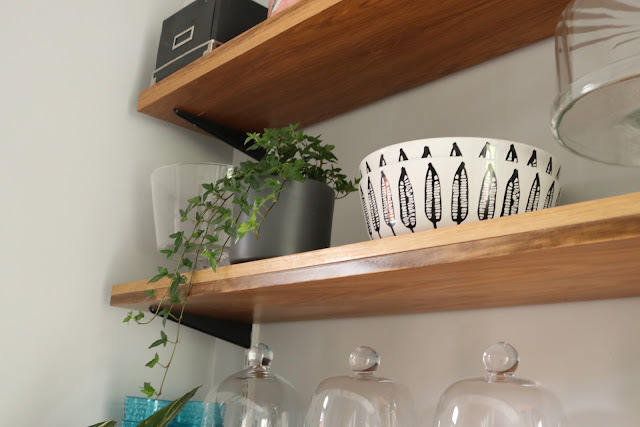 I rehung my IKEA posters that I had bought years ago, and filled the shelves with my favourites glassware and storage jars that I could now confidently display on our stunning new shelves. 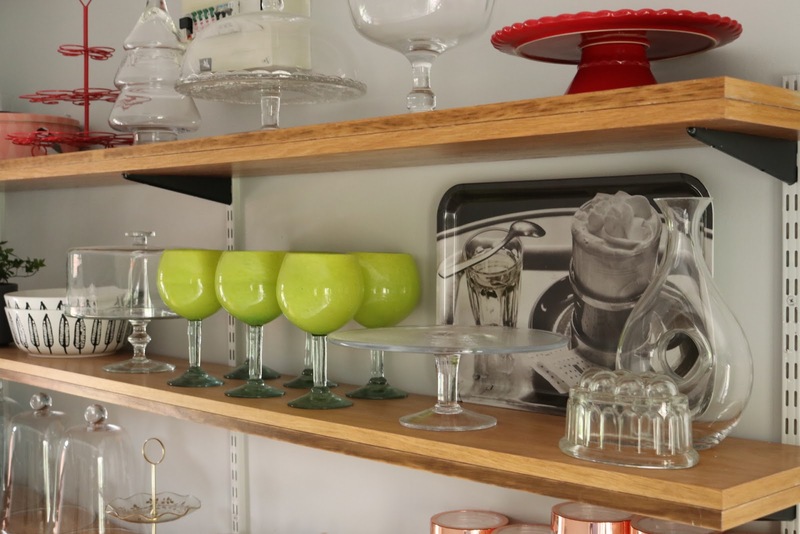 Finally, I had a home for my favourite kitchenware pieces, like these stunning lime green hand blown glasses below I bought many years ago in Crate and Barrel in New York and hauled back in hand luggage. They are heavy, huge and perfect for sipping pina coladas and lush mojitos on summer nights. 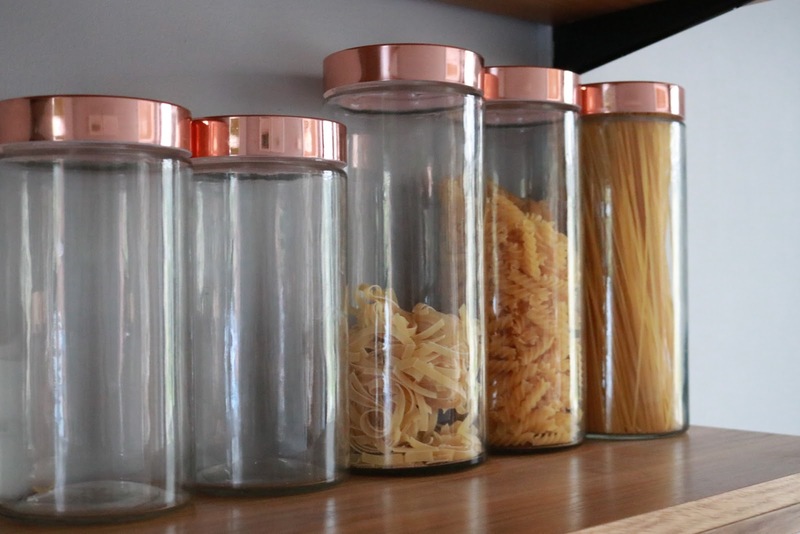 I love these rose gold top storage jars I got in TK Maxx that I use to store different pastas and rices. 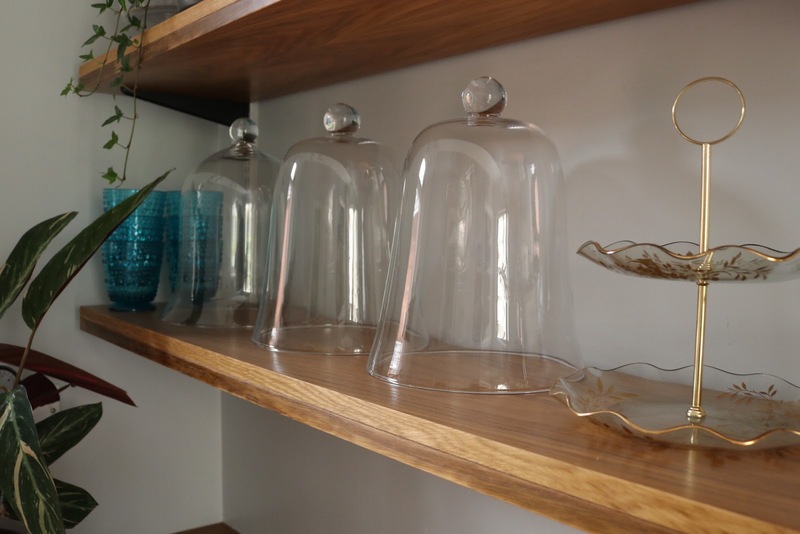 I got these glass cloches from The White Company and this glass and gold cake stand was a charity shop find. The blue glasses are plastic outdoor tableware I picked up previously in TK Maxx. 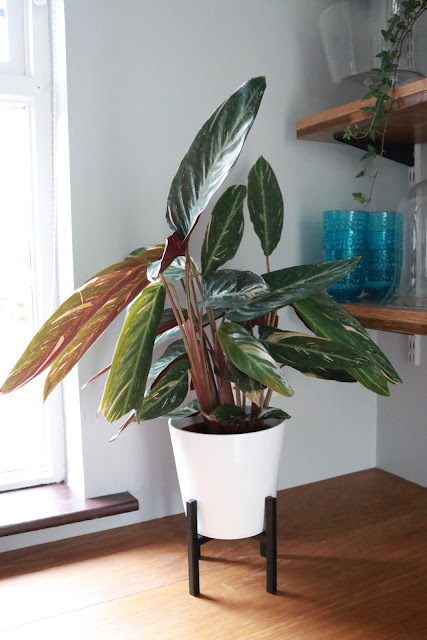 I also added some plants to the shelves and the worktop that I picked up on the reduced shelf in Tesco like this ivy and this calathea that was reduced to just €5. It was a little worst for wear when I got it but with a little TLC it's looking much better. I picked up the plant pot in Lidl last year for €4.99 and the black metal stand was €9.99 from Johnstown Garden Centre. 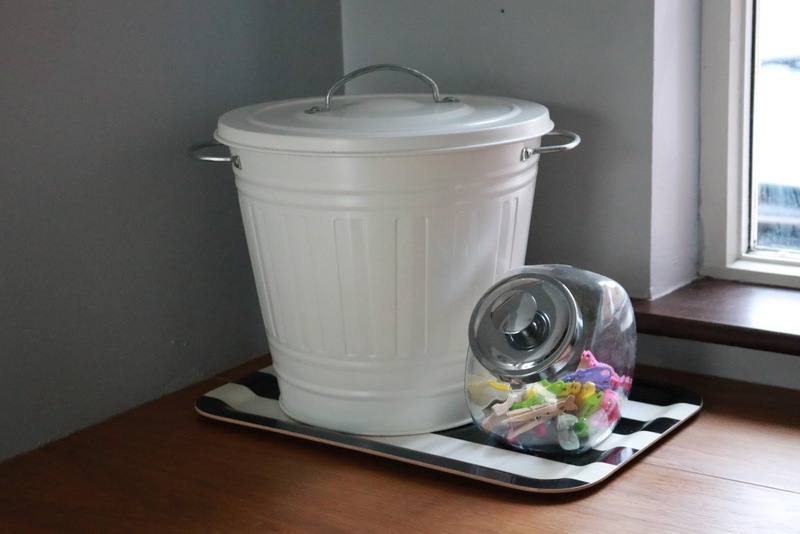 It sits opposite this IKEA container that I use to keep washing powder in and this little cookie jar that's handy for clothes pegs. 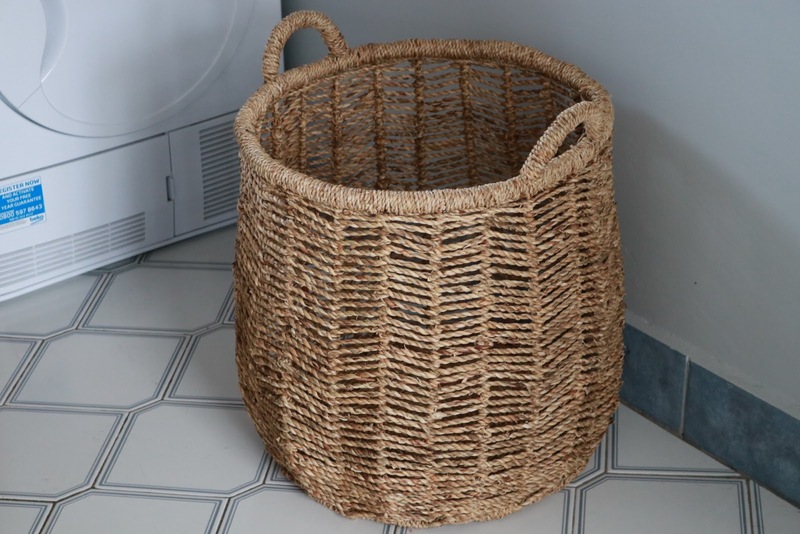 My laundry basket was another great TK Maxx find for €38. It's a real beauty and it is very big so great to hold all our laundry in one place. 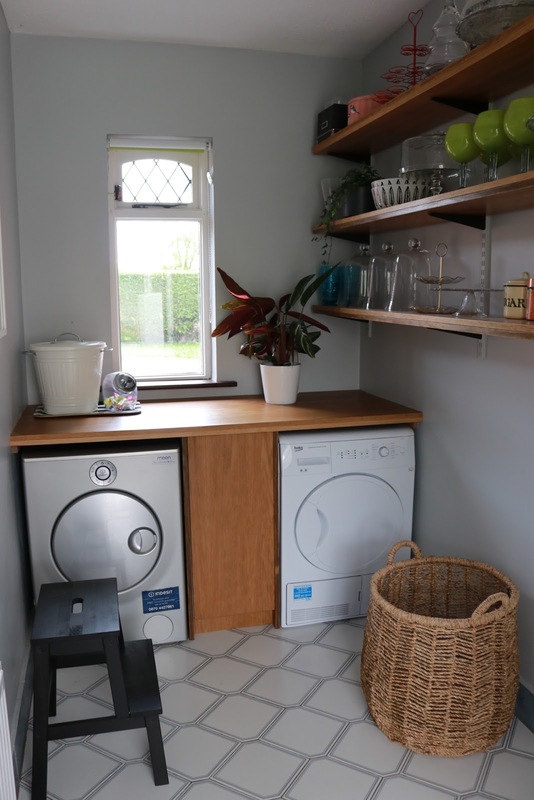 So, after a long wait, a stroke of luck, a little elbow grease and DIY, we finally have a laundry room we don't have to scoot out past any more to our garden. I'm now awash with love for it.